Natural stone surfaces are beautiful, but if not maintained properly they'll lose their luster and appearance. 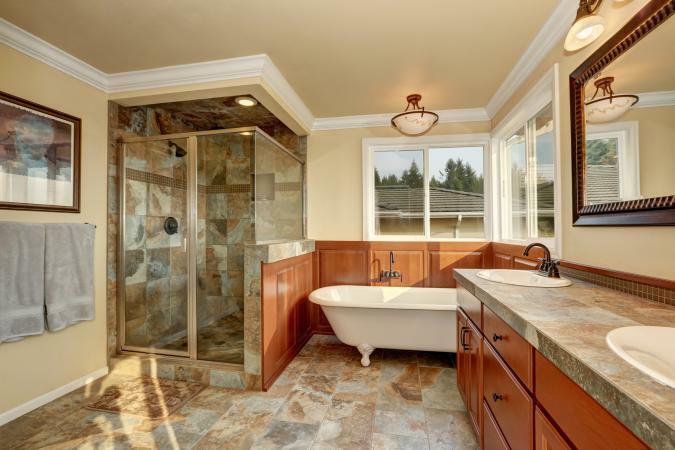 Surfaces can be made of granite, limestone, marble, slate, sandstone, or travertine and are used on the floors and countertops within bathrooms, kitchens, and foyers. To keep your stone looking clean, you'll need to use natural cleaning products specific for natural stone, set up daily cleaning and maintenance routines, and take precautions to care for and protect your surfaces. 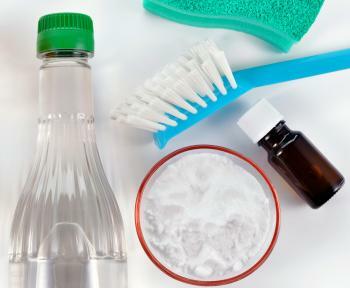 Natural cleaners, also referred to as green cleaners, are easy to make, affordable, good for the environment and will not damage or dull your stone, leaving it looking clean and polished. If you prefer to use a store-bought cleaner, stick to solutions made specifically for natural stone, such as stone soap (like Supreme Surface Daily Stone Cleaner) or a mild dish soap or detergent. Most siliceous stone - granite, sandstone, slate and quartzite - manufacturers recommend using vinegar to clean and maintain your stone surfaces. This solution works well in kitchens, foyers and bathrooms. Do not use this vinegar solution on marble, limestone, travertine or onyx surfaces unless they've been sealed, as the acid from the vinegar will harm them. If you want to mask the vinegar smell, consider using a few drops of orange, lemon, lavender or rose essential oils in the solution. This solution will leave your floors or countertops with a nice pine-fresh smell. It also contains castile soap, which is a gentle product made from vegetable oil. No matter how hard the water, castile soap will not form soap scum so it's perfect for bathroom vanities, showers and bathtubs. This solution works best for marble, limestone, travertine and onyx. These fragrant wipes can be used in between mopping or deep cleaning to wipe down spills or surfaces. Since they contain vinegar do not use these wipes on marble, limestone, travertine or onyx unless they've been sealed. Mix all ingredients in a bowl. Stack your cellulose cloth in a stack or jelly roll-style depending on how you will store them. Place the cloth in the mixing bowl with the solution allowing them to absorb the liquid. Immediately place them in the air-tight container, can, or plastic bag. If you feel your bathroom shower, tub or sink needs a little more scrubbing, this solution will help those hard to clean areas and is safe on all natural stone surfaces. Mix the first four ingredients and put into a plastic squirt bottle. Then, pour water in - just the amount to make a smooth paste by shaking container or stirring ingredients. Squirt the solution on to the stone surface and then wipe area clean with a damp cloth. Rinse well. This solution is also safe for all stone surfaces. Mix the baking soda, salt, and essential oil together in a small cup. Add enough vinegar to make a paste. Apply paste to the surface, and scrub with a damp cloth or scrub brush. Rinse well. If no other cleaning solutions worked on your marble, limestone, travertine or onyx for removing a stain, this scrub may work. Use a small amount and rinse immediately. If the solution dulls the surface, polish it with a soft cloth and a polishing solution specific for natural stone surfaces. These cleaning techniques along with a general knowledge of how to prevent stains will help you protect your stone. A few cleaning tips will help prevent staining and problems. If using store bought cleaners, be careful not to use too much cleaner or soap because it may cause streaks and leave a film. Always use a soft, clean cloth versus a mop, wringing out the cloth by hand. 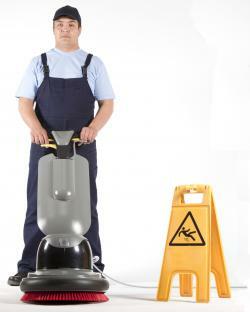 If mopping a floor, consider washing the floor by hand or putting the damp cloth under a rubber broom. After scrubbing a dirty surface do not place your wash cloth back into the mop bucket or bucket full of cleaning solution; instead grab a clean cloth and put the used, dirty cloth in the laundry. Only clean rags or cloths should be put in the wash water so the water stays clean and the surface gets cleaner. Always rinse the surface with a damp cloth removing any soap residue. A steam mop is another safe tool to clean up and sanitize natural stone floors. Natural stone will require some maintenance to keep it looking its best. To protect your natural stone floors dust them daily with a clean, untreated dry dust mop to keep them free of abrasive sand, dirt, grit or debris. In foyers or atriums, always keep a non-slip mat or area rug near the entrance to catch this debris. Protect your countertop surfaces in kitchens by using coasters under all glasses, particularly under glasses containing alcohol or citrus juices. Do not place hot pans or dishes on your countertops after removing them from the stove. Always use trivets, heating pads or mats under hot dishes and pans. Some items such as china, ceramics, or silver will scratch your natural stone surfaces, therefore use place mats under them. In wet areas that produce soap scum, use a squeegee after each use of a shower or bathtub to minimize the scum. Blot the spill immediately keeping it from spreading further, and remove any loose debris to prevent scratching. Clean the area by flushing: pour water mixed with a mild soap or one of the natural cleaning solutions listed above over the area, rinsing several times. Dry the area completely with a soft cloth. Repeat as necessary. If the stain remains then you'll need to use a stain-removal poultice. Oil-based stains (lipstick, grease, tar, or cooking oil): Use your normal cleaning solutions on marble, limestone, travertine or onyx. On granite, slate, sandstone or quartzite you can use mineral spirits or acetone. Organic stains (coffee, food, tea or tobacco): On granite, sandstone, slate or quartzite you can use a 1/2 teaspoon of hydrogen peroxide or a few drops of ammonia directly on the stain and remove with a damp cloth. On marble, limestone, onyx or travertine use your normal cleaning solution. Ink stains (magic marker or pen): On lighter, white stones use bleach or hydrogen peroxide. On darker, black stones use acetone or lacquer thinner. Use small amounts and remove immediately with a cloth and rinse with a damp cloth, particularly on marble, limestone, onyx and travertine. Scuff marks on floors: Apply two to four drops of essential oil neat ("neat" means undiluted), any type of oil or fragrance will do and wipe away clean with a cloth. Rinse with a dash of vinegar. If marble, limestone, travertine or onyx use water instead of vinegar. Water rings or water stains: Polish these out with a polishing solution and soft cloth on all stone types. Stains on grout: If a stain shows up on your grout, clean up the area with your normal cleaning solution and a toothbrush or thin scrub brush that will fit within the areas between the tiles. If the stain remains consider a grout colourant, paint or dye to cover up the stain like Aquamix Grout Colorant. If you decide to change the color of your grout in your bathroom or kitchen consider using a dark color versus white or off-white to hide future stains. Prepare the poultice in a plastic, disposable container by mixing the powder or cleaning agent with water until it's formed into a paste consistency like toothpaste. Wet the stain area with distilled water. Apply a large glob of the paste to the stain so it's about ¼ to ½ inch thick over the stain and beyond the stain area. Cover the poultice with plastic wrap tapping the edges down with painter's tape. The poultice will need to dry. Allow about 24 - 48 hours, depending on the size of the stained area. The drying process is important because that's what pulls the stain from the surface and into the poultice. Once 24 - 48 hours has passed, remove the plastic and allow the poultice to dry some more. An hour should be more than enough time. Remove the poultice by rinsing it with distilled water. A wood or plastic scraper is sometimes needed to remove tough areas. Once removed, buff the area with a clean soft cloth. If you apply this to a calcareous stone, such as limestone, marble or travertine, buff it out with a polishing powder and 0000 scouring pad. If the stain is not removed, repeat the process. If the stain is still not removed after a second application, it's recommended to consult a stone professional for further cleaning instructions or repair. Sealing your natural stone surfaces helps maintain your surface appearance and repel stains. 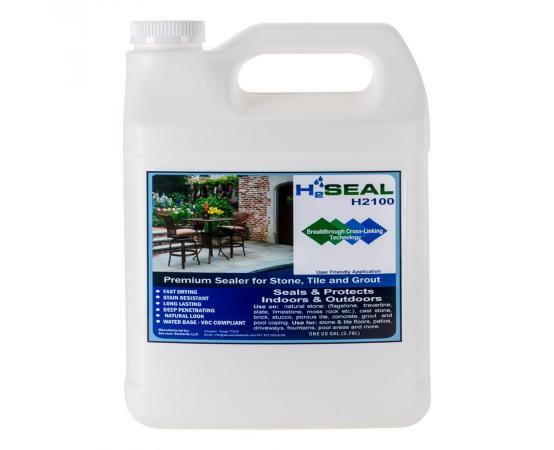 There are normally two types of sealant used on natural stone surfaces. Topical sealant is a film former and coating designed to protect the stone from water, oil and other contaminants. This sealant is made up of acrylic, plastic compound or natural wax. If you apply a topical sealant, the maintenance program you would have used for the natural stone will shift to maintaining the sealant instead. Each maintenance program will depend on the brand and manufacturer's instructions, normally located on the container. This leads to stripping and reapplication of the sealant over time, which might be once every few years depending on the brand used. Topical sealant is used on most interior natural stone surfaces but not recommended for exterior use due to the elements wearing down the sealant and moisture entering it, forming cracks. Keep in mind that this sealant can also alter the appearance and texture of the stone after applied. For example, if your stone is honed (slight glossy finish) or flamed (rough texture), a topical sealant will make this surface appear glossy and polished like marble. Impregnator is a water- or solvent-based solution, which penetrates below the surface forming repellents. It's a "breathable" sealant that allows moisture in, which is why kitchen countertop surfaces or bathroom vanity tops have an impregnator applied. Ask yourself, does this area really need to be treated? It may be easier caring for the stone surface without sealant than the hassle of treating and reapplying a sealant. One exception would be if you have a porous stone, such as marble, limestone, onyx or travertine in a messy, high-traffic area in your home, such as a bathroom or kitchen - in these cases, it's a good idea to seal this stone to help maintain these surfaces. According to the Marble Institute, before sealing your surfaces contact the manufacturer or fully understand their warranty and instructions. Consider the life span of the sealant; you will need to reapply it every one, two, three or four years and keep a log of each application. Never switch between products without fully understanding the damage or issues it will cause because not all products are made the same. The main concern in switching products is chemicals reacting to each other and producing an acid that will harm your stone. If your surface appears dull and needs polishing, you can use a soft, micro cloth to polish it along with a polishing powder, compound or diamond abrasive solution meant for natural stone surfaces. Some popular brands are Weiman and Simple Green ranging from $6 to $40. If a soft cloth does not work, then use a 0000 scouring pad or hand-held slow-speed polishing machine with a polishing powder. Floors can be polished using these polishing powder solutions along with a dry dust mop or a slow-speed floor polishing machine. Maintaining your natural stone surfaces is tough work but if done correctly, they'll keep their beauty and last for years to come. Make sure you clean, maintain, seal, polish, and remove any stains, and it will be worth it.